Budapest lacks nothing of whatever it is that makes any major European city worth visiting. On the contrary, the city ticks off the entire spectrum of tourist assets and complies with any high standard of tourist demand. Lying on the both banks of the Danube River (literally consisting of the former cities of Buda and Pest), Budapest, on top of all, offers a spectacular view of architectural greatness. Despite the fact that the city underwent an extraordinary economic and industrial boom, being at the same time the political and administrative center of Hungary, it had the ability to preserve the touch of nature and to turn it into tourist value. A place bristling with history, culture, elegance, refinement – this is Budapest in a just a few words. Budapest is said to have been first inhabited by the Celts, but it soon became part of the Roman Empire, being the main Roman city in the Lower Pannonia. After undergoing a brief dominion of the Bulgarians, the place was conquered by the Hungarians under Arpad, representing the hub starting from which the Kingdom of Hungary was built. The Tatars also had an attempt to enforce their rule over the city, but they were dealt with by the Hungarian King at the time. A difficult moment was represented by the Ottoman dominion (a centuries long rule). The historical climax of Budapest was attained during the 19th century, when the city became the capital of the Austrian-Hungarian Empire. A difficult period was experienced during World War Two, when a significant part of the historical and architectural heritage of Budapest was destroyed. Nowadays Budapest is the proud capital of Hungary. Given its appeal for visitors convinced of the tourist worth of the city, Budapest makes available a fairly large range of accommodation solutions by means of hotels, hostels, apartments and rooms for rent, and pensions. Luxury establishments are far from being scarce in Budapest, so one should rest assured that their extravagant tastes will be complied with by the finest hotels located on the Danube's banks. Yet, Budapest also host a great deal of hostels and pensions which provide accommodation services of satisfactory quality at a reasonable price. The presence of international cuisine in Budapest goes without saying, but one should not spoil their stay in the city with such dishes. On the contrary, they should try some of the most spectacular specialties so characteristic of the Hungarian cuisine. For instance, the goulash is a must-try which should not be overlooked, especially in winter, but other dishes are also recommendable: chicken with paprika, fish broth or porkolt. A refined connoisseur of the gastronomical phenomenon will be able to identify the Austrian influences on the Hungarian cuisine, but these influences were creatively absorbed by the local cuisine, resulting in a final original gastronomical expression. Budapest's coffee shops are reliable drinking and eating venues, but they have turned, in time, into genuine institutions of great appeal for tourists. They are definitely worth visiting. Tourists who want to have a fruitful stay in Budapest must mobilize all their planning skills in order to manage to visit all the significant objectives in the city, since they are extremely numerous, and overlooking them would be nothing but a nuisance. The most important landmarks with historical background are the Fisherman's Bastion, the Budapest Citadel, the Dohany Street Synagogue, the Basilica of St. Steven, the impressive Buda Castle, the Hungarian Parliament building, or the Gellert Hill. 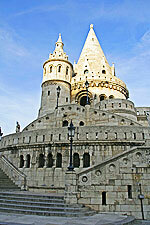 Other landmarks refer to the Buda Castle Labyrinth and to the State Opera House. Budapest also hosts more than 70 museums and galleries, some the most interesting being the Bible Museum, the Crime Museum, the Liszt Memorial Museum, the Holocaust Memorial Center, on the one hand, and the Budapest Art Gallery and the Museum of Fine Arts, on the other hand. The Planetarium, the Vidam Amusement Park and the Zoological Garden are just as much worth visiting. Budapest proves to have quite an eventful calendar, so no tourist will even begin to get bored while exploring the city. The Titanic International Film Festival, the Danube Carnival, the Budapest Palinka Festival and the International Circus Festival are some of the most significant festivals held in Budapest. The Budapest Spring Festival, the Summer Festival and the Autumn Festival are just as valuable on the cultural scene of the city, but the list should also comprise, for instance, the Budapest International Half Marathon, the Sziget Festival, the Caucasian Challenge, the Jewish Summer Festival, the International Wine Festival and the Budapest International Marathon in order to make an adequate impression of the city's busy calendar.